The National Flag is a symbol of our struggle for national unity. 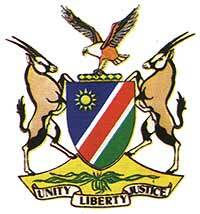 It symbolises peace, unity and a common loyalty to Namibia. The Flag is rectangular, with the colours arranged diagonally across it. The top lefthand triangle is blue, the centre band red and the bottom righthand triangle is green. The colours are seperated by narrow white bands. On the blue triangle is a golden sun with twelve triangular rays. The rays are seperated from the golden centre by a blue ring. The African Fish Eagle has excellent vision and is thus a symbol of the farsightednes of our country's leaders. The Welwitschia Mirabilis, a unique desert plant, is a fighter for survival and is therefore a symbol of our nation's fortitude and tenacity. The headband refers to our traditions and the diamond shapes to our natural resources. The flag is rectangular with three triangles in the colours blue, gold and green. The gold is charged with the Coat of Arms. The use of the President's Flag is restricted to Namibia. When the President travels to other countries only the National Flag is used. 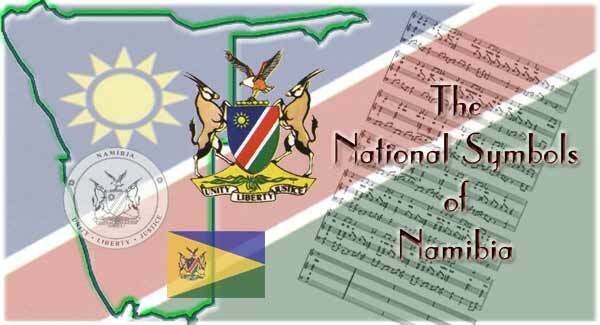 This means that only the National Flag can be flown in foreign countries to represent Namibia, while the President's Flag represents the status and authority of the President in Namibia.